New to the Outlaw Garden? Start Here! Hello and welcome! I’m Cristina, the rule-breaking gardener behind the Outlaw Garden. Whether you’re brand new to the Outlaw Garden, or a returning friend, I’m so glad that you’re here! If you enjoy gardening outside the lines, this site is for you! We break the rules by growing veggies in our front yards, mixing edibles and ornamentals, applying landscaping ideals to vegetable gardens, and much much more. We are the rule-breaking, status-quo-defying, outlaw gardeners. Come join us! Thanks again for visiting the site, and happy gardening! What is an “outlaw” garden? Where is the Outlaw Garden? How do I get started with my own outlaw garden? It all started with my home purchase in a community with a Home Owners Association (HOA). Like many towns, cities, and communities these days, my HOA forbids vegetable gardens in the front lawn. But, well, the backyard was super shaded, and I wasn’t about to forgo homegrown tomatoes. So, I decided to break the rules. To go rogue. I planted those tomatoes (and a whole lot more). And the Outlaw Garden was born… er… planted. Now, I think the term “outlaw” goes way beyond the where of your garden. It’s also the what (mixing tomatoes with flowers?) and the how (using landscape techniques to make those veggies really shine?). Anytime we challenge the status quo of vegetable gardening, we break the rules. We become outlaws. Gardening outlaws. That’s what this site is about. We break the rules. We challenge the “right” way to do things. And, sometimes, we discover something really cool — like the fact that cherry tomatoes look great as sprawling ground covers through flower beds. Of course, it’s also still about growing veggies in front yards, flower beds, and other unexpected places. Gotta stay true to our roots. Ha! I’m working on a big expansion to the “explore the garden” section on this site. In the meantime, I can give you some of the basic stats about the garden. I’m in the great state of Virginia — USDA Zone 7a — about an hour west of Washington, D.C. That puts me at about the midpoint of growing zones in the United States. Some of you are farther north and others are farther south — keep that in mind as you read. My house sits on a half-acre of land within a 1970s-era housing development. The soil is a mix of Virginia red clay, sandy sandy fill, and pockets of nice fertility (mostly due to me bringing in compost). There’s absolutely nothing special about my yard, home, or garden. I’m working with a very typical canvas — probably very similar to what a lot of you have — and am slowly adding more garden beds each year. It’s a work in progress, like most gardens. The weather here can be interesting. We get a bit of everything in the Mid-Atlantic, but we specialize in thick, muggy, buggy, cut-with-a-knife summertime humidity. This makes tomatoes and other fungus-prone plants a big challenge. Winters are usually pretty mild, but we get bitter-cold exceptions every few years. Springtime is usually marked with big, loud, damaging storms, and summers are often dry (despite that humidity) with occasional unpredictable downpours. I don’t know where you live and garden, but please keep your local conditions in mind when reading this site. The challenges for growing tomatoes here are very different than in Seattle, for example. Oh gosh. That’s a great question. And, you know, the answer will be different for each of us. I’m working on a big summary of how I transformed my front yard into a vegetable garden, but in the meantime let’s go with this: Start wherever you are, and with whatever you have. Working with an established landscape and looking for an easy transition? Why not plant a few veggies in among your annual flowers this spring? Do you have a lovely patio with great sun exposure? That’s a great place for growing sweet potatoes or other heat lovers in big containers. Already have a huge veggie garden out back? Why not work some flowers in there, and invite some of your veggies into flowerbeds or containers out front. My biggest piece of advice would be to not rush it. Pick one spot and make it awesome. Then move on to the next. And repeat. I’m super excited because this spring I finally launched a project I’d been working on for y’all for ages: The Outlaw Garden Grow-Your-Own Guides for Beautiful, Edible, Rule-Breaking Gardens. The series will ultimately include a dozen or more books about growing specific crops in the front yard landscape. Corn, melons, tomatoes, peppers, and much much more. I started with sweet potatoes. The first Grow-Your-Own Guide runs about 45 pages long, and tells you everything you need to know about growing sweets. 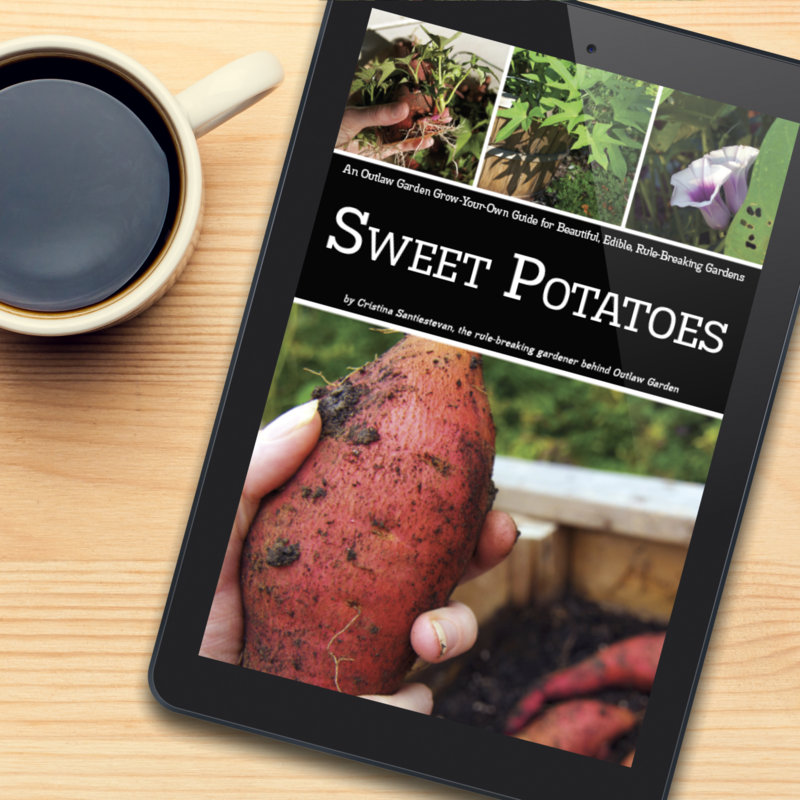 In the guide, I explain how to start your own slips (baby sweet potatoes) from store-bought roots, how to transplant into the garden and tend your plants all summer long, and how to harvest, cure, and store your sweets for homegrown eating all winter. Click here to buy yourself a copy. Like any good garden, this page is a work in progress. If there’s something else you’d like to know, please post a comment at the bottom of the page or just send me a note at cristina@outlawgarden.com. Thanks again for visiting the Outlaw Garden! ps. Many, many thanks to the very talented Rob Cardillo, who snapped that photo of me when he came to photograph the garden for an Organic Gardening Magazine article. If you like beautiful garden photography, you will LOVE Rob’s work. Check it out! how do i grow mushrooms from scraps? No idea, Carolyn. I haven’t tried growing mushrooms yet, so I won’t be of any help. I’d suggest trying an internet search. Good luck! I know this post is a little old but I wanted to say that once I had some button mushrooms growing in my compost pile! I imagine that they sprouted from some scraps I threw in there. I do know that there are many references on the internet about growing mushrooms. I was especially interested in growing shitake type. I found that you can buy the spawn plugs and bore them into logs. It’s a whole world of knowledge to gain! Hi Cristina! Just wanted to let you know your last link is broken (…you will LOVE Rob’s work. Check it out!) Feel free to delete this comment once you’ve read it. Thanks! I’ll get that fixed right away. Greetings from Finland! I have a question about sweet potatos. Do you think it would work o er here as well? I live in midvestern Finland, (in Kronoby if you want to google it) and i would love to grow my own sweets this summer. The weather is the most sunnies and warmest between May and July/August. Thank you for a great site! Hi, Hanna — I think it’s worth a shot! My suggestion would be to select an early-maturing variety, like ‘Georgia Jet,’ ‘Beauregard,’ or any other variety that has a maturity of about 90 days. Then, find the warmest place possible on your property. Perhaps even a container set out on a dark-colored driveway or patio that will reflect heat. You might also consider using black-plastic mulch, which should help heat the soil. Basically, sweet potatoes want it as warm (hot!) as possible. You may not get as large of a harvest as someone living in a warmer climate, but I’m guessing you’ll at least get something (and even small sweet potatoes are perfectly yummy). If you do decide to give it a try, I’d love to hear how it goes! Good luck! OMG! 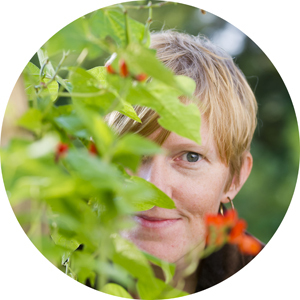 Do you know that you are the first “real” gardener/blogger, from my gardening zone, that I’ve run across? I am soooo excited to explore your site, tap into your knowledge and read your blog. Do the streetlights that shine all night on my garden affect plant growth in my outlaw garden? I’m not positive, but I doubt it. (1) I just harvested sweet potatoes for the first time. Many are very small and similar in diameter to a carrot. Have you found ways to cook and eat these? (2) My SP were often intertwined with many being very long, maybe twice the length of what I buy at the store, but not as big in circumference. Is this due to overcrowding? I planted in raised beds that contained about 8 inches of soil. The boxes were 4×4 or 16 sf, and I planted 13 to 14 slips per box. In planning for next season, I know I need to use more sand, think I need to add more depth to my boxes, and possibly plant fewer slips per box. Any suggestions appreciated. Hi Susan — I think you may have been dealing with two things there: over crowding and (maybe?) heavy soil. Sweets really like sandy soil, and do need some space to spread out. I generally plant two slips in my 2×2 planting boxes. So that’s two slips per four square feet, which is much less dense than what you had. More depth would also be a big help. Can you double that depth and also spread them out a bit more — hopefully that will help! As for those little and skinny tubers, if you haven’t yet used them, I’d suggest cleaning them (leave the skin on) and chopping them up to roast in the oven or to slow cook in a stew or soup. They should taste just fine. I tried growing sweet potato this year. They did ok some very very large but most on the small size. I cut some slips from mine and put in water. They have roots but the weather will be getting cool not cold in central Florida for several more months. Can they still be planted. Mother remembered as a child helping her parents and said her dad took slips from the crop they were harvesting for replanting the next crop. She didn’t remember what he packed them in and for how long. Apologies for the long overdue answer here… You should be able to overwinter those slips inside, either in water or planted and treated as houseplants. Here in Virginia, I don’t try to overwinter the slips. I just set aside a few tubers for starting new slips come spring. Either should work for you. Howdy! I’ve been growing sweet potatoes in pots for a few years, but being a very novice gardener I don’t know if I can grow other things like calla lilies and canna lilies in the same pot at the same time. You know, a lovely center piece lilly with sweet potatoes vines trailing down the sides? Will the lilies make the sweet potatoes un-edible? The lilies certainly won’t make the sweet potatoes inedible. I’d give it a try — sounds like a lovely idea! The general rule of thumb with planters is spill, fill, and thrill. That basically means something that spills over the edge (especially nice in tall planters or hanging baskets), something that will fill in nicely, and something that’s a real eye-catcher. 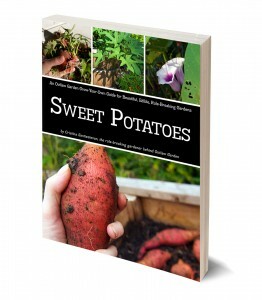 My favorite edible “spill” plant is a sweet potato. Nasturtium would also be lovely as a “spill” plant. For the “fill” plant, there are just so many choices (and the best choice will depend upon the size of your planter). Any leafy green, many herbs (including Thai basil), and even something like bush bean or strawberry. The “thrill” plant is often a single specimen of something big or dramatic or colorful. For a smaller planter, your Thai basil could be perfect. A nice pepper or eggplant could work in a larger planter. This is a great question, by the way. I’ll do some more sleuthing and will try to have some suggestions posted before next spring rolls around. If you have any ideas from your own research, please do share! Hi, Lori — Congrats on those sweet potatoes! What you’re describing sounds a bit like cold damage. Sweet potatoes are awfully tender, and get cranky when temperatures start dipping below 50°F. Is it possible that your tubers experienced colder-than-50s temperatures before or after you harvested them? For storage, sweets honestly do best in about the same conditions that we do. I often just store mine in a box in a closet, or even sitting on the counter. As for using those sweets, you should be fine if you use them soon. You may need to cut out those brown spots, but the majority of the flesh should still be good. If you’re using them for Thanksgiving, my guess is you should be fine. Fingers crossed!